Sold in sets of two, these car dollies are the wheels for your wheels. 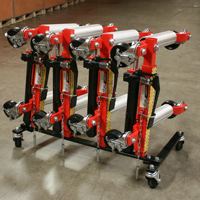 Ranger Products GoCart car dollies and autocarts make moving your vehicle painless for you and your employees. Take advantage of precious floor space by effortlessly moving your vehicle against a wall or into a tight space or corner with the help of GoCart car dollies. It's precise positioning power without having to even turn the car or truck on. Ideal for moving dead cars and trucks of up to 6,000 lbs. with a complete set of four GoCarts. GoCart vehicle positioning jacks allow one person to effortlessly move autos, trucks, boats, trailers, lawn mowers and tractors, jet skis, motorcycles, airplanes, or other wheeled and recreational vehicles with ease. Note: Operators may require assistance stopping vehicles once they start rolling on GoCarts by Ranger Products. 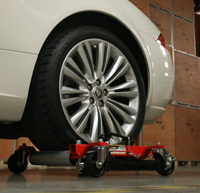 We also offer the essential GoCart automotive wheel dolly stow and tow cart for easy mobility and storage. See the GoCart vehicle positioning jack and dolly demo video below. Operation procedures for the GoCart mobile car and truck dolly could not be simpler. Simply extend the telescoping GoCart to its maximum width. Then roll the GoCart over to the vehicle so the aluminum rollers "hug" the tire. Twist close the valve and repeatedly step on the foot pump. 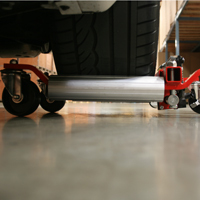 The GoCart rollers will quickly and smoothly engage the tire and prop up that quarter of the vehicle. Once you have reached the desired height, secure the pump mechanism into place and insert the pin into one of the GoCart's elevation locks. Do this for each desired wheel and you'll experience GoCart's easy rolling dolly perfection in no time. These heavy duty car dolly carts feature a quick-action hydraulic foot pump to lift any car or light truck in seconds providing instant mobility in any direction. A multi-position locking pin secures the load after the unit is raised to the required height. Reinforced, non-skid brushed aluminum rollers ensure a solid and stable tire support and a low center of gravity makes them safe and stable during use. Each GoCart car dolly features a two-inch tubular steel telescoping main frame and 1.5" x 1/2" solid steel caster bars for superior strength and durability. Precision bearing, multi-directional free-swivel casters allow effortless mobility and direction changes. Fiber-filled phenolic resin wheels are non-marking to help protect delicate flooring surfaces and are resistant to corrosion from oil, water, grease and commonly used acids or solvents and. Lightweight GoCarts retract and stow for compact storage and can be loaded into the trunk of a car or on a tow truck for easy transport. Tire width capacity: 12” / 305 mm. Casters/frame height: 6” / 152 mm. Stowed dimensions: 21” x 24” / 533mm. x 610 mm. Measurement from end of caster to handle: 18” / 457 mm.